Before last year’s race, I fell in love with the idea of a t-shirt to help promote galactosemia awareness. Unfortunately, I left it until the very last minute and ended up ordering a single printed t-shirt from an online company and let’s just say the quality left something to be desired. So this year, I decided to get an early start and plan on having several printed for friends, families, and supporters. Thanks to a recommendation from my lovely friend Erin, I contacted Artistic Imprints in Camp Hill (who prints the shirts for her family’s nonprofit, Running for Rachel). The quality of those shirts is excellent, so it was really a no-brainer! After working with them on the design and pricing, we have the final product (pictured below) ready to go! 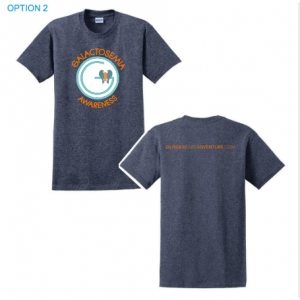 For anyone interested, the shirt alone is just $20 BUT if you are kind enough to donate $50 or more to our Team CHOP campaign for galactosemia research, we will send you a shirt for FREE! We have quite a way to go on the campaign and every little bit helps. Please contact either John or myself through the website, email, phone, or social media with your sizes or we’ll be in touch if you make a donation through CHOP (please just make sure your name is visible to us on the back end). Orders due by August 31, 2017. Thank you as always for your love and support!